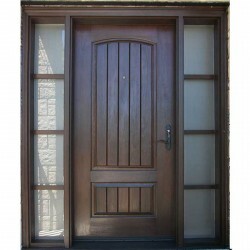 Rustic doors are produced to provide a classic charm while bringing a contemporary appeal to any home. Each door in the Rustic Series contains deep graining and distinct panel detail that resembles true distressed wood without any of the drawbacks. Rustic 2 Panel Round Top 8 ft..
Rustic 4 Panel Cathedral 8 ft..
Rustic Planked 1 Panel 8 ft..
Rustic Planked 1 Panel Arch Top 8 ft..
Rustic Planked 2 Panel 8 ft..
Rustic Planked 2 Panel Arch Top 8 ft..
Rustic Planked Arch 2 Panel..
Rustic Planked Heritage Arch Top..
Rustic Planked Heritage Arch Top 2 Panel..